Misrata, a city of several hundred thousand people about 150 mi. east of the capital of Tripoli, is under, and for weeks has been under siege. Qaddafi’s strategy is to starve it out, deprive it of essentials, and bomb it indiscriminately, as a way of defeating its esprit de corps an allowing a pro-Qaddafi takeover. Qaddafi clearly thinks that the NATO no-fly zone becomes useless if he occupies all the significant cities in the country, then hides his tanks in the conquered cities. Moreover, if he can take Misrata, that victory would free up men and weapons for deployment against Benghazi itself. Qaddafi’s indiscriminate bombardment of the civilian city, and his blockade on food, water and medicine, is a crime against humanity. Misrata’s besieged people need to be rescued. Benghazi is sending some aid by sea on fishing boats which are protected by NATO naval forces. But Benghazi itself is suffering from shortages. 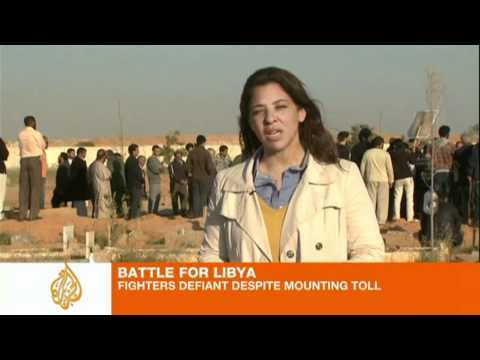 More from France24 on the defense of Misrata. BBC Arabic reports that rebel sources say they repulsed two attacks by Qaddafi forces on Misrata, Libya’s third largest city, in which the Tripoli military brought up heavy artillery (and likely GRAB rockets) with which to bomb the city center. Meanwhile, NATO says its planes destroyed 5 tanks attacking the city. Reuters Arabic reports that Nouri al-Ibar, who coordinates aid from Benghazi for Misrata, said that many residents of the latter are dying because of a medicine shortage in the city. Egyptian refugees from Misrata are saying the city is being subjected to ‘indiscriminate’ bombardment, which is a war crime. Radio Free Libya reports that the Benghazi government rejected African Union mediation because the terms it offered were unacceptable. Rebels say that no peace plan can succeed if it does not involve the departure of the Qaddafis, and that the withdrawal of his forces from major cities must precede the declaration of a cease fire. Benghazi Voice of Free Libya in Arabic on 11-12 April continued to air criticism of the peace plan for Libya proposed by the African Union (and the one put forward by Turkey) for failing to guarantee that Al-Qadhafi and his sons would step down, though one presenter said this did not mean that all mediation efforts would be rejected. The radio reported the arrival that day (11 April) of the African mediation delegation in Benghazi, saying that hundreds of demonstrators gathered outside their hotel to express “their rejection of any settlement that does not include the stepping down of Al-Qadhafi and his sons”. One prisoner who introduced himself as Muhammad Muhammad al-Sharif from 7 April brigade, said “they brought me here from Misratah with 35 people… They handed us over to a colonel called Shihatah.” He hailed the rebels’ treatment of prisoners. A female announcer presented a press review from a variety of newspapers, including Libya Al-Yawm. At 1040 GMT on 12 April, a female presenter discussed “the means that tyrants follow when they feel that defeat is approaching”. At 1045 GMT, female presenter Intisar Fa’iz presented a 20-minute press review from a variety of Libyan and pan-Arab newspapers, including Intifadat al-Ahrar, Libya al-Ahrar, Biladuna, the London-based Al-Sharq al-Awsat, Al-Dustur, Oman al-Yawm. At 1145 GMT, an unidentified announcer introduced someone called Idris from Al-Marj to discuss “a demonstration to be staged today to support the Doha initiative.” Idris said the demonstration would stress that the first condition in any initiative should be the stepping down of Al-Qadhafi.